Jessica and Harry are Fun In The Sun Weddings’ newest newlyweds! 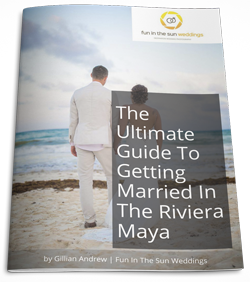 This globetrotting bride and groom settled on a Riviera Maya wedding without ever having been to the area before, and they were absolutely blown away. Jessica and Harry met in the mailroom at work. Their first date lasted from morning til night, starting with a hike in the morning, lunch, movies and ending at a concert. They have been inseparable ever since! Not long after, they spent a year travelling around Europe together. We can certainly attest to the fact that if you can backpack together, and come home still in love, then you’ve got what it takes for a successful marriage! I don’t care where we are, as long as we are together. And then he proposed. Awww! Jessica had never dreamed about her wedding, and didn’t give it much thought until she needed to start planning it. They both knew they wanted a small outdoor wedding somewhere beautiful. 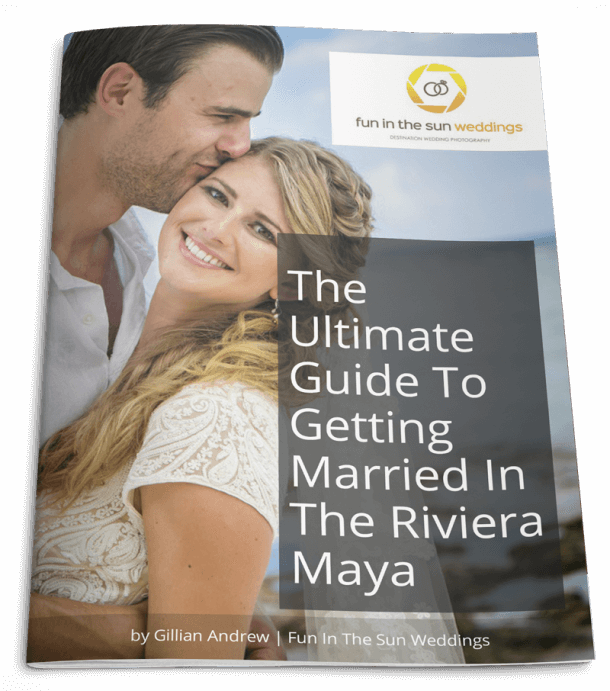 Harry’s family is in the UK, and Jessica’s is in the USA, so getting married in Mexico seemed like the best solution for everybody to have a sunny holiday together. They went solely off other people’s input, having never been to the area before themselves. 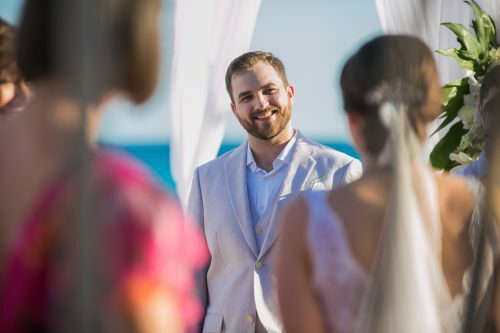 They were married on the beach at The Grand Luxxe Vidanta Riviera Maya. 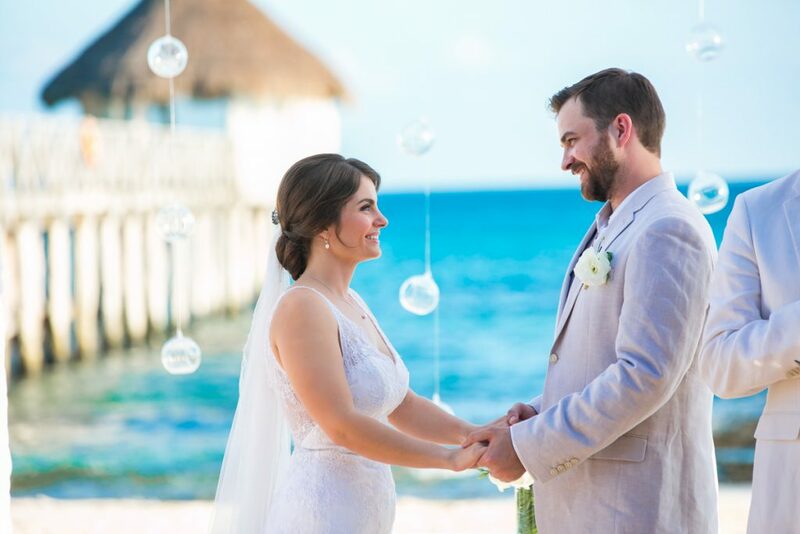 Jessica was a stunner in her beach wedding dress by Lian Carlo, and Harry’s grandmother’s lace wedding veil. What were their favorite moments? Jessica says hers was reading their personal vows, trying to keep emotions in check when they could hear family and friends crying. And Harry says his was watching Jessica walk down the aisle. 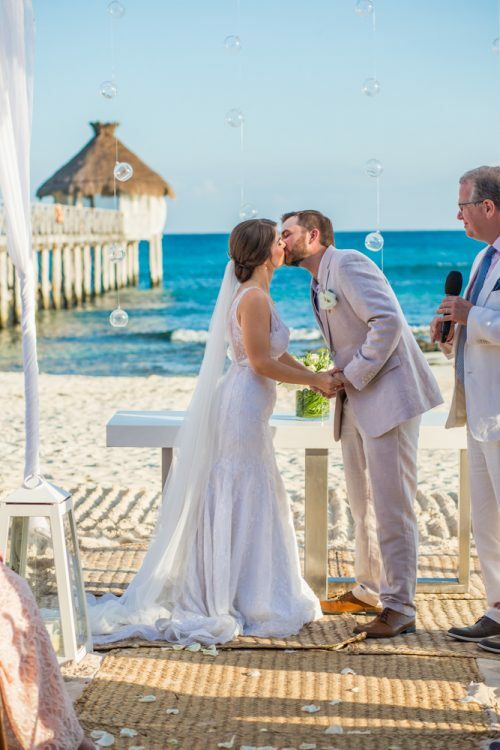 The bride’s advice to the brides-to-be getting married on the beach? When the day comes, don’t worry about a thing. Just relax and look around. Take in every moment and every detail. 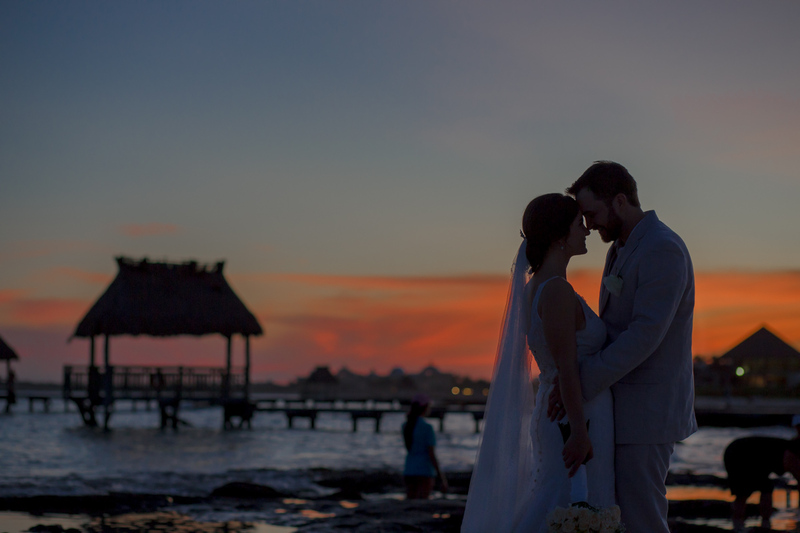 Jessica and Harry, it has been a true honor capturing your wedding and the memories of your special day. We wish you nothing but happiness in this new chapter of your lives together. Congratulations! Want to know more about the Grand Luxxe at Vidanta Riviera Maya? Read unbiased reviews on Tripadvisor here. 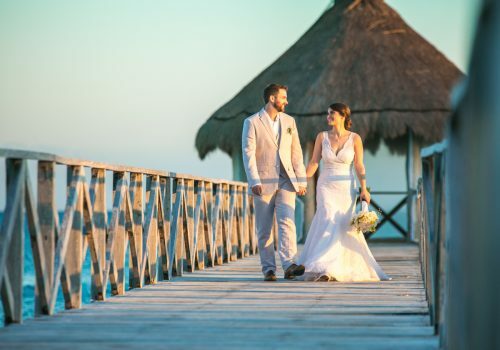 In the months leading up to our wedding in Riviera Maya, we knew we needed to find an amazing photographer to capture one of the most important days of our lives. My now-wife searched and searched and stumbled upon a picture she loved. She found that it was taken by Marc with Fun in the Sun Weddings so she sent an email inquiry and got a response almost straight away from Gillian. The next few weeks, we went over the details and we were sure we had made the right decision to hire Marc to photograph our wedding. The big day came and everything was such a blur. With so many things going on, it was impossible for us to focus on all the details. Marc was fantastic in his organisation, professionalism, and sense of humour. He knew exactly what needed to be captured and how best to accomplish it. He was so much fun to work with and was able to set everyone at ease. 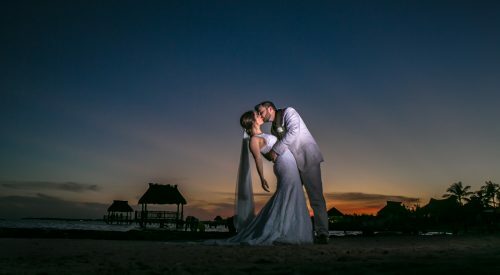 Fast forward a few weeks to when we received the pictures and we were blown away! We were obviously already fans of Marc's style but the photographs went far beyond, even our expectations. There is no way we could've chosen a better photographer. Despite the day being a blur for us, we will always have these incredible images to look back on to remember what an amazing day we had. To anyone getting married or just needing family pictures taken, we cannot recommend Fun In The Sun Weddings enough.